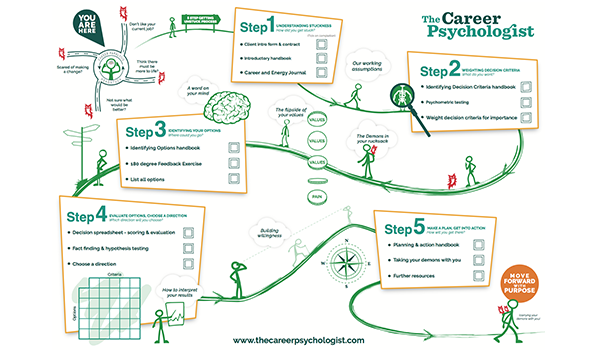 The Career Psychologist offers a rigorous, 5-step process which helps our clients get unstuck, identify which direction would suit them best and move forward with purpose. An interactive 1 page summary of the whole process can be downloaded here. If you feel stuck in your career, this process will help you separate what you think you should do from what you really want to do, and give you skills to overcome the anxiety that inevitably comes with change. In this first step, we help you really understand how and why you got stuck. You’ll explore the thoughts, emotions and sensations of stuckness. And you’ll learn how your mind can keep you trapped there. The key outcome here is a commitment you make to yourself over actions, timeframes and how you will respond when the going gets tough. We’ll help you establish what really matters to you in work and in life so that this can be the basis of your career choice. Money and lifestyle are part of that, but you’ll also work out your core values which are fundamental to finding meaning in work. Some of your criteria may well be contradictory but you’ll understand that that’s ok. This step ends with a set of decision criteria, weighted for importance, to guide you moving forward. This is a highly creative process in which all potential avenues are explored. The idea is to leave no stone unturned in the search for the best possible career option for you. That might include a big change, a portfolio career, self-employment, a new employer, job crafting or even consciously staying where you are with some changes. You’ll take a month to explore new ideas, play, take risks, speak to new people and search for new possibilities. And not – yet – to analyse or discount things. The result is a detailed list of all possible options to take into step 4. Now you’ll evaluate your options using decision science techniques. You’ll narrow options, letting some go and researching others in more detail. An iterative process, you’ll end up with a positive decision about your direction and next steps. And you’ll also get clear on what you will need to accept by taking this decision. Everything will probably still feel very scary, but you will know you have de-risked the change through and thorough and objective decision-making process. Having developed a clear vision for the future, we now put together a plan to make it happen. You’ll get into action using mini life experiments, ‘bold moves’ … or a single step. We’ll help you with all parts of the plan, from clearly communicating your strengths at interview to financial planning. We’ll also teach you practical and evidence-based skills to deal with the demons that will try to derail you. So you will move forward with purpose, carrying your demons with you on the journey. Initially I felt getting unstuck was going to be a long and arduous process but she radiated such excitement and passion that it was so contagious! I recommend The Career Psychologist to anyone who is feeling they are living an unfulfilled life and needs that extra help to really realise their potential.